Server Maintenance On November 23..
Release of brand new costumes: Magic Royale Costume Sets. The Stars Academy is the most prestigious magic school in all Meridia, and only expert magicians can attend. In order to dress up accordingly for such a exclusive institution, the most stylish magicians prefers the Magic Royale Set. Today's Puzzle will also be in the company of some of the most skilled attendants of the Stars Academy School: Meteor, Charlotte, Alythia and Chronos. These majestic looking goddess will grant you new awakened powers. Of course, the Academy wouldn't be completed without the influence of the Greatest Goddesses of Meridia. Our founders, our inspiration; Marisa and Amaris costume will also be obtainable from today's Puzzle, and the lovely twins ornament. Both men and women will be able to dress up with an unique style inspired by the stars. 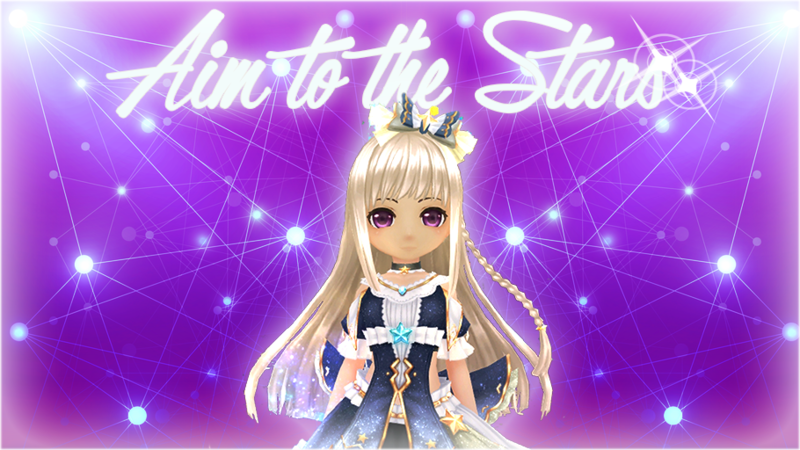 Time Magic, Magic Explorer, Royal Prince and Princess, Angelic Lace Dress, Goddess Hairstyles, Blessed Star Dress and more! And to make a perfect attendance, today's Puzzle will also be filled with gorgeous and ethereal wings that will make you look like a descendant of the stars yourself. Our AP Store will get filled with power on this week's special edition. You will meet a brand new set of costume weapons that will certainly make you look and feel stronger. With the release of the Staff of the Universe and some other gorgeous looking weapons, your character will feel more powerful than ever. But if this isn't enough, the shop will also get filled of strong buffs and legendary cards to make you hit as strong as you feel! The Loyalty Store will get a much darker and dangerous sensation. If you have been waiting for the release of the Blood Moon, the Dark Starry Serena, wait not longer! Our LP Store will pay tribute to the dark side with her, Michelle, Esther, Cocotte, and Dark Belle Senshi Contracts. Plus, all kind of majetic looks to make your character of a true magic look. Sorceror Costumes, Michelle's Costumes, New Halloween Designs, and more! Our Bonus Mall will get filled with the fallen leaves, a gorgeous autumn and oriental look. The Guardian of the Ancient East Forest will make her debut, and her sunny asian vibe will be in good company of fashion, accessories, and other Gods. So if you are ready to go full asian and feel fully blessed by luck, Lele will certainly not disappoint. Bonus Mall will update on November 12. Also, remember the Halloween Event ends today! GoGo had enough candies to celebrate, but you know she is not a big fan of sharing. So she will be going back to her lair until next year, to finish all that halloween candyon her own! Her name is actually "Lele".